I claim no great originality for this Shutoff. However, it works well and can be made using only hand tools, drill, soldering iron and high speed cutting disc. There are no turned components. The Shutoff is held open by a torsion bar spring acting as a "trigger" sitting in a slot in the 4mm tube. 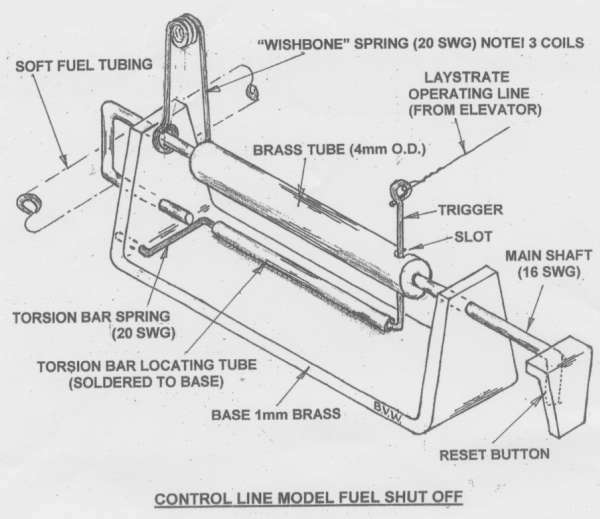 When the trigger is pulled out of the slot (by the application of momentary down elevator) the wishbone spring forces the shaft across trapping the fuel tubing and cutting off the flow of fuel. The Shutoff is reset by pressing on the end button. The trigger then slides along the 4mm tube and automatically drops into its slot thus locking the system "open" ready for the next actuation. Fine adjustment of the system is made much easier by fitting a threaded adaptor and R.C. metal clevis at the elevator end of the Laystrate actuating wire. The dimensions can easily be altered to suit the particular application .The 4mm brass tube is soft soldered to the 16 SWG piano wire and should be long enough to ensure that the trigger cannot fall off the end of the tube when tripped. Brass is preferred as it is harder and less prone to wear than copper. The "wishbone" spring gives a good force in a short space and avoids the problems associated with coil springs (eg coils touching when the unit is reset and insufficient force). In some applications however a standard coil spring may be satisfactory. If this change is made then I suggest a washer is soldered to the end of the tube to stop the spring slipping over it. The torsion bar section of the trigger should be a free fit in the locating tube which is soft soldered to the base. Ensure the return section of the 16 SWG wire does not foul on the end of the torsion spring.